I am working my way through series on my TBR pile/Wishlist and finally devoured the Georgina Kincaid series. Grab a cup of cocoa and some Christmas cookies while I share my thoughts on Succubus Heat, Succubus Shadows and Succubus Revealed. 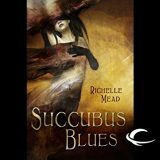 Succubus Dreams by Richelle Mead is the third book in the Georgina Kincaid series. This urban fantasy series features Georgina a succubus and her motley crew of friends ranging from angels to humans. Filled with snark and a topsy-turvy romance each case features a mystery that Georgina finds herself in the middle of make this an exciting series.